Individuals and teams looking for easier, more effective ways to brainstorm, plan, collaborate, and achieve their goals are invited to participate in Mindjet’s webinar series to learn more about the power and benefits of the new features in MindManager® Enterprise. MindManager promotes free-form thinking and enables individuals and teams to visually organise complex ideas and information and easily transform them into strategies and plans. Many of the world’s leading companies trust MindManager because it delivers a complete solution that works with the platforms, applications, and services they rely on. Enterprise ready, MindManager integrates into any corporate environment with simple network deployment, SharePoint integration, support for industry-standard authentication protocols, and a depth of functionality unmatched by other applications. With its enhanced Gantt Pro module, MindManager Enterprise enables organisations to take advantage of the power of Gantt charting to better plan tasks, projects, and resources. Gantt charts can now be opened in a separate window, ideal for users with two screens. Users can quickly navigate through any project and visualise days, including weekends and non-working days, to keep projects on track. 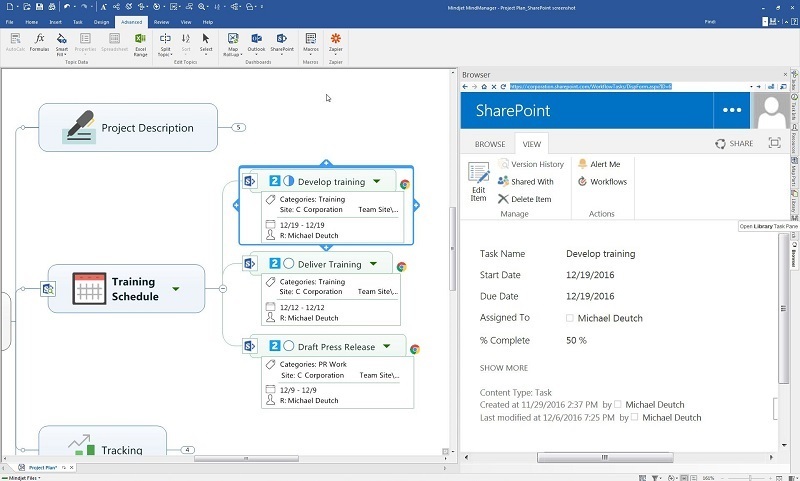 MindManager Enterprise offers dramatic new improvements to its SharePoint support with Task Synchronisation that now includes Categories in addition to task name, priority, progress, resources, start date, and end date. Users can also import resources from SharePoint into MindManager, simplifying the process to create projects, and assign tasks that are synchronised and tracked in SharePoint. Plus, users can now take advantage of support for Office 365 Authentication, Azure ADFS/On Premises Authentication, and Multi-Factor Authentication. MindManager Enterprise now makes it easier than ever to share maps with anyone. Users can break down barriers by exporting maps to an interactive HTML5 file which can be shared and viewed on any modern browser. And MindManager Enterprise’s new Reader applications enable everyone in an organisation to access the power of teams’ data on Windows and Mac. To learn more about the new MindManager Enterprise and the benefits it can offer your organisation, please register for one of our upcoming webinars or view a pre-recorded session. MindManager helps business professionals achieve more by efficiently organising and clearly communicating complex ideas and information. With over 4,500 corporate customers and 2.5 million paid users, including 83% of the Fortune 100 companies, MindManager mind mapping and information visualisation software enables brainstorming and creative problem solving, improves communication, and gives users the ability to plan and complete complex projects more efficiently and effectively. MindManager Enterprise combines Mindjet’s industry leading mind mapping and visual planning tools with patented data integration features, as well as flexible communication options to support project coordination and knowledge sharing across the organisation. Mindjet is a division of Corel Corporation. For more information, please visit http://www.mindjet.com/.